Every day you're on the lookout for sophisticated attacks designed to penetrate your organization and steal valuable information. At the same time, you need to increase network speeds and capacities to accommodate the proliferation of consumer-grade applications and devices. To adequately defend against threats across such a broad range of applications and devices - without slowing down your network - you need a high performance next generation/edge firewall (NGFW) appliance for deep inspection, visibility and control. The FortiGate 1500DT high performance next generation/edge firewall delivers best-in-class performance with an exceptional 80 Gbps of firewall and superior next generation threat protection. Custom hardware, including the latest FortiASIC™ NP6 processors, and the consolidated security features of the FortiOS™ 5 network security platform make the difference in enabling protection of your applications and network without affecting availability or performance. High speed connectivity is essential for network security segmentation. 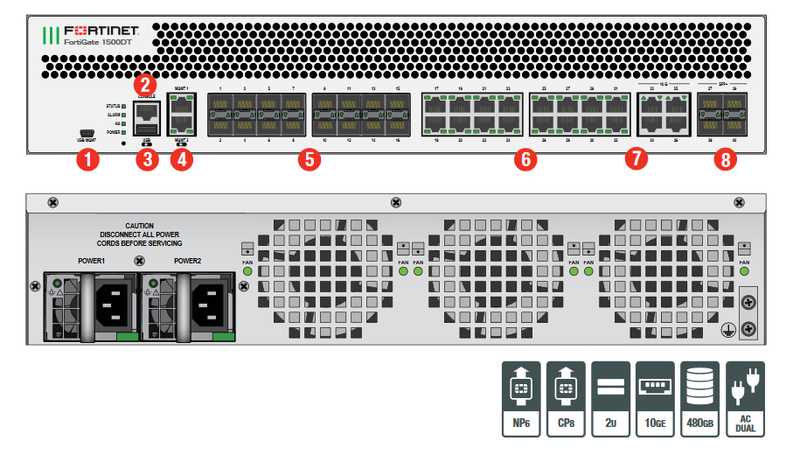 The FortiGate 800D provides 10 GE slots that simplify network designs without relying on additional devices to bridge desired connectivity. Comprehensive Security - Contr ol thousands of applications and stop more threats with NSS Labs Recommended IPS, sandboxing, VB100 certified antimalware and more. Superior Control and Visibility - Stay in contr ol with rich visibility over network traffic, granular policy control, and intuitive, scalable security and network management. Robust Networking Capabilities - Optimize your network with extensive switching and r outing, high availability, WAN optimization, embedded WiFi controller, and a range of virtual options. Premium Services - For global or regional customers who need an assigned Technical Account Manager, enhanced service level agreements, extended software support, priority escalation, on-site visits and more. Note: All performance values are "up to" and vary depending on system configuration. IPS performance is measured using 1 Mbyte HTTP files. IPsec VPN performance is based on 512 byte UDP packets using AES-256+SHA1. For complete, up-to-date and detailed feature set, please refer to the Administration Handbook and FortiOS Datasheet. 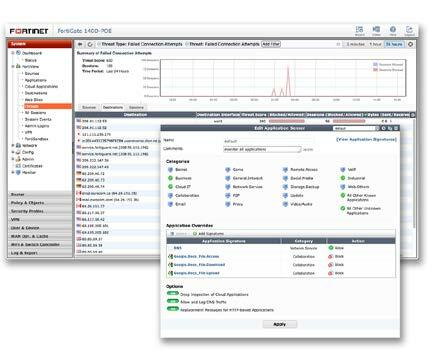 Download the Fortinet FortiGate 1500DT Data Sheet (PDF).